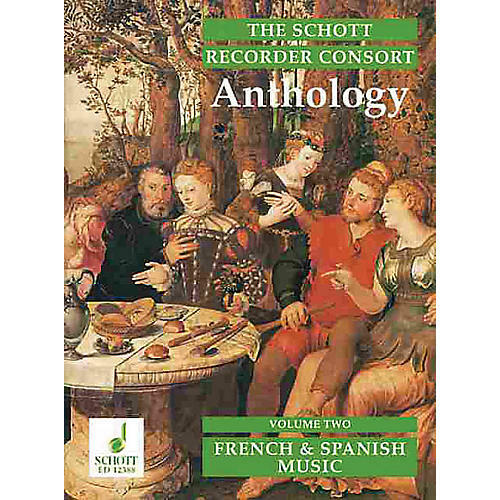 The Schott Recorder Consort Anthology presents a wealth of music from the fifteenth to the seventeenth centuries. Although the bulk of the collection is laid out for a variety of four-part ensembles there are also duets and trios, as well as five- and six-part pieces. The repertoire includes both original instrumental works and transcriptions of vocal pieces. There are lively and stately dances, fantasias, and arrangements of expressive madrigals, catchy chansons and more restrained religious pieces; all are chosen for their effective realization by recorder consorts. 136 Renaissance pieces with notes on sources, editorial technique and interpretation. Contents: Anonymous: L'Amour de moy I (ST) · Anonymous: L'Amour de moy II (STT) · A. Willaert: Allons, allons gay (SAT) · C. de Sermisy: Jouissance vous donneray (SATB) · C. de Semisy: Il me suffit (SATB) · Anonymous: Gentil Mareschal (SATB) · P. Sandrin: Douce Memoire (ATTB) · R. de Lassus: Bon jour, mon coeur (SSAT) · E. du Caurroy: Fantasie sur Ave Maris Stella (SATB) · Anonymous: Three Dances from the Philidor Collection (SSATTB) · J. Planson: Ma Bergère, ma lumière (SATB) · Anonymous: La zorrilla con el gallo (SAT) · Anonymous: Propinán de Melyor (SAT) · J. de Anchieta: En memoria d'Alixandre (ATTB) · F. de la Torre: Alta (SAT) · Anonymous: Ora baila tu (SAT) · Anonymous: Riu riu chiu (SSAT) · Anonymous: Fantasie (AA) · A. de Cabezón: Tiento (SATB) · F. Guerrero: Ojos claros, serenos (AATT) · G. de Wert: De que sirven ojos morenos (SSATB) · J. del Encina: No tienen vado mis males (ATTB).